I’m like a kid in the Asian fusion candy store when I walk into Amasia. 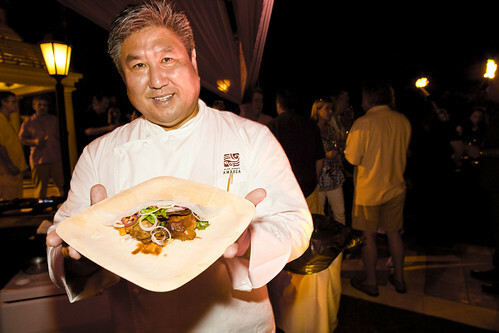 Chef and owner Alan Wong has taken all the delectable specialties–sushi, dim sum, the neighbor’s hibachi, the corner store, baby luau, Chinatown–and tossed it together in his own fusion flavor. The restaurant recently celebrated its first year on Maui at the Grand Wailea, and created a special three-course tasting menu that starts at just $49 per person. They’ve had a longer standing five-course menu tasting that gives you a tour of the restaurant’s different cuisine styles, but the three-course tasting holds up well in comparison. First thing to note is that Amasia is a tapas/small plate place. You will want to order several small dishes here. One recent recommendation from a friend was that nine plates were sufficient for two people. But don’t be ashamed if you want to surpass that–there’s no shame in that here. The menu is shaped by the four styles of cooking: raw bar, sushi bar, robata grill and the main kitchen. You’ll also notice a few of the dishes “borrowed” from the favorites list from Wong’s Oahu restaurant (those are marked with a special icon). When at Amasia, I have an incredible time deciding what to try. The menu was originally organized by preparation, but now it’s by proteins. With so many dishes, it’s easy to lose focus, and the tasting menu helps you avoid this. But three courses isn’t much to eat, right? In actuality, the entree course is served as a quartet of dishes. There’s also a “supplement” section where you can add sushi and sashimi. Want to pair it? No problem: let them know if it’s just wine or wine and sake–both are options. Starting with the first course, you have two choices: sushi bar or salad. The spicy ahi roll has a surprise twist with crispy potatoes and green onion, or you can go with the Asian pear salad, a wonderfully refreshing mix of thinly sliced but still crisp fruit and similarly sliced radish, greens, gorgonzola, orange, and candied garlic pecans. The chardonnay reduction dressing is heavenly. From there your quartet is served, and it covers all of the main kitchen favorites. The ahi meatball in Angry Sauce is one of the first things I fell in love with at Amasia. 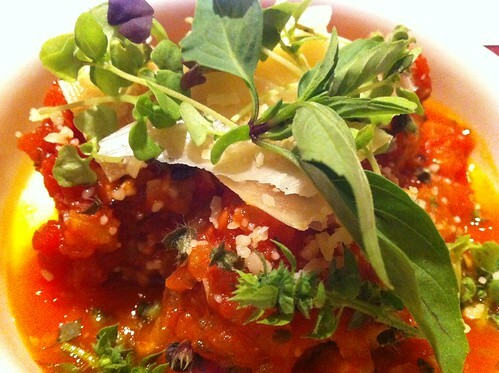 It’s tuna, formed into meatballs and covered with a spicy Italian inspired tomato sauce that they call “Angry Sauce,” and then topped with a kiss of Parmesan and fresh basil. The recipe appears in Wong’s Blue Tomato cookbook. 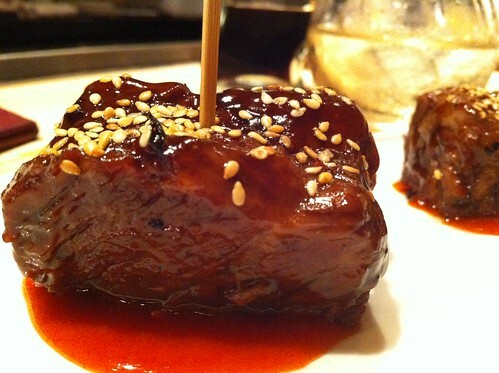 If you perused Yelp, then you saw the buzz on Amasia’s soy-braised short ribs. They are a boneless tender chunk of beef that’s perfectly slow cooked with a sweet soy flavor. The ko choo jang adds some depth and kick. I like the fancy toothpick served in it, no utensils are needed. Next up, the duck bun is dim sum finessed into fine dining. 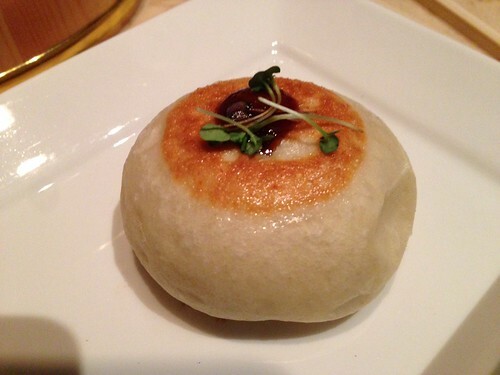 You could describe it as a fancy baked manapua, but that doesn’t do it justice. The delicate bun has a high gloss finish, the bread is light and slightly crisp on the exterior and the duck filling is sweet and savory. You eat it and all you can think of is having more. 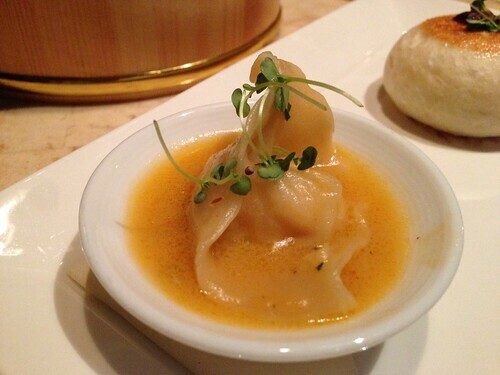 The final taste in the quartet is the seafood won ton, which is served in a black bean lemon grass chili veloute. The won tons are not fried, the dough is tender, the seafood has perfect minced seasoning throughout, but it’s the veloute that really makes this entree shine. The quartet is followed by the dessert course. Your choices fall between the Waialua chocolate pudding and the lilikoi malasadas. 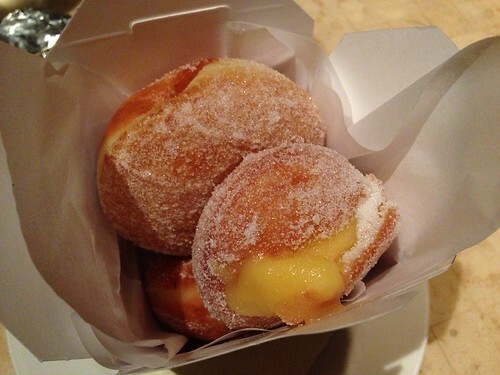 The malasadas are served in a cute Chinese box stuffed with their sugar dusted goodness, and the tang of creamy lillikoi in the middle make them irresistible. I haven’t been able to stray from the the malasadas, but Waialua chocolate (from Oahu’s North Shore) is some of the most incredible chocolate made in our state. 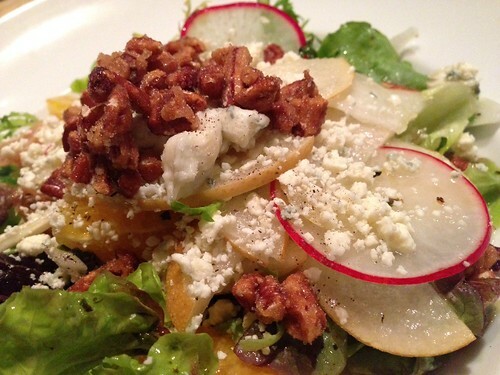 If the three courses leave you hanging, you can just embellish from the menu or do the five-course tasting. Some of the must-try dishes in the five-course tasting include the chopped ahi sashimi, presented as a stack with avocado and crispy won ton chips, and the beef tenderloin skewer (you also have the choice of any dessert). If you can, try the shave ice pineapple–it’s an elevated version of our island’s favorite frozen sweet treat.